Christmas Eve 1811 the English warship “St. George” stranded on the Danish west coast. The event cost 1300 people lives, with only 13 sailors surviving. No Parking has helped bring the story to life, and created installations around some of the objects that were saved from the wreck. 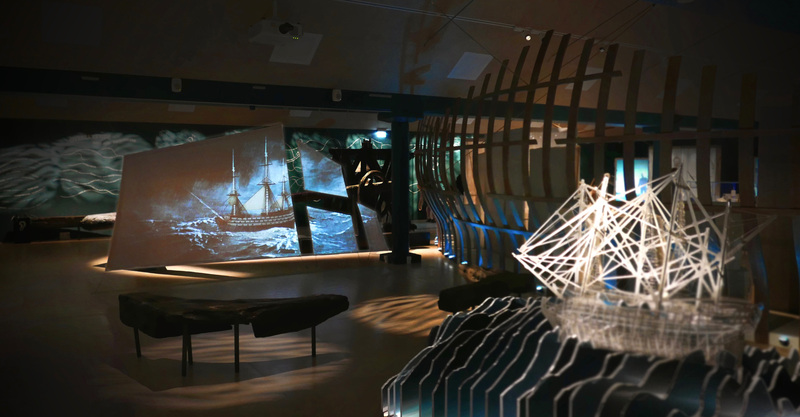 One of the first things you see when you enter the exhibition, is a big projection on screens that are suspended in a shape resembling sails. No Parking made several experiments with the projection layout, which was coordinated with the museum and its exhibition designers “Event Communications”. The show here is an animated film about the stranding of St. George. The style of the movie is made in a combination of 3D animation and filmed live actors. The film was digitally manipulated with inspiration from the British painter “Turner”, which often painted maritime motifs. On the film, the painting becomes alive – we experience the ship’s stranding on the seabed, and the crew’s bitter battle against weather and water, while Danish spectators on the beach are cut off from coming to help. No Parking’s sound designer composed a dramatic sound scope, that helped bring the story to life. The next door room exhibits many objects from the ship – from guns to plates. In this room, No Parking has made 6 videos displayed on 6 large upright screens. Here you can see scenes from daily life on an English warship – Captain’s reading of charts, the use of a Sextant, the doctor’s operating table, the Pursurs loading work, a sailor working with ropes, and gunmen loading and firing a cannon. No Parking has also made an installation that is very popular with children visiting the museum. At the bottom of the museum, the children can chase around for crabs and treasures on an interactive floor with a nice soft sandy bottom. The interactive ocean floor is projected from directly above, where there is also a stereoscopic sensor that can detect the children’s movement around the floor. In this way, a projection is created that is directly responsive to the children moving around, giving them a real sense of trying to capture the dodging crabs and capture the glittering treasures that only appear in short moments.